“Part street theater, part performance art, part sporting event” — Pat Keck, of the 1980s inspiration for the project, World Sculpture Racing. To these ends, People’s Sculpture Racing stages races and exhibitions of mobilized art, holds workshops to teach the art of mobile sculpting, and participates in educational and outreach events, such as Cambridge STEAM events, Cambridge Science Festival events, and Maker’s Faires. PSR also promotes sculpture building and racing curricula for schools. Sculpture races are short races (< 1 mile) of pushed, pulled, and select pedalled artwork in urban locations followed by exhibitions. People’s Sculpture Racing currently stages two annual races and exhibitions. The People’s Sculpture Race, a juried race that takes place at the Cambridge Arts River Festival each June. Proposals are due in March; projects are due on Raceday. 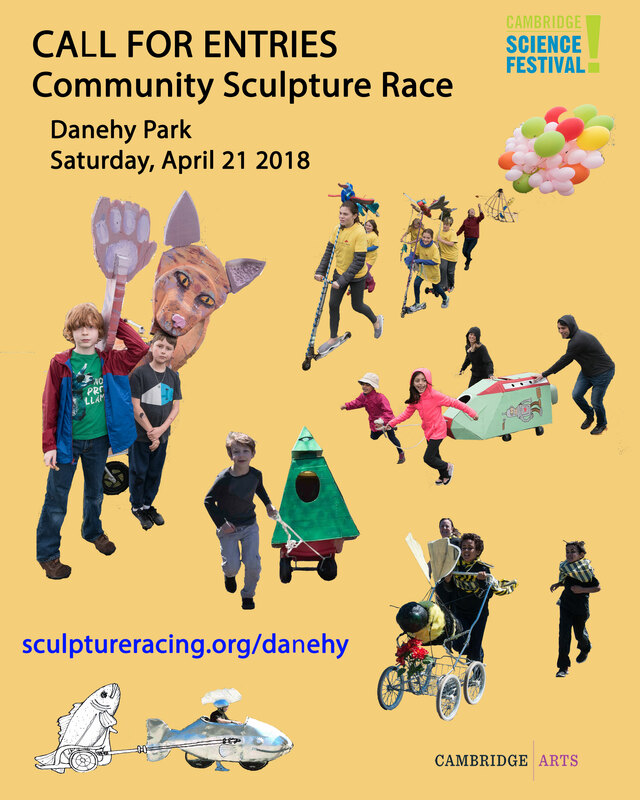 The Community Sculpture Race at Danehy Park each April during the Cambridge Science Festival. This is an unjuried race; applications are due by the last minute in April. PSR was founded in Cambridge, Massachusetts in 2014 (with its first events in 2015) as a revival of and tribute to the World Sculpture Racing Society’s races, which took place during Cambridge Arts River Festival events for five years in the 1980s, and in other locations nationally and worldwide. It was founded by artists Geoffrey Koetsch and Kirby Scudder. A cousin genre, Kinetic Sculpture Racing (KSR), unknown to WSRS’s founders, expanded nationwide, including in Baltimore, Philadelphia, and Lowell (The Lowell Kinetic Sculpture Race). The KSR genre is structured around engineering challenges of having to traverse water, sand, and mud. The WSRS genre, contrariwise, emerged from the arts–fine art sculpture, installation and performance arts, happenings, and was personally curated by Koetsch and Scudder. It also featured a strong kinetic component emblematized by Arthur Ganson’s work. Please see the World Sculpture Racing page to learn more about the sculpture racing genre. We thank WSR Co-Founder Geoffrey Koetsch for his kind mentorship. 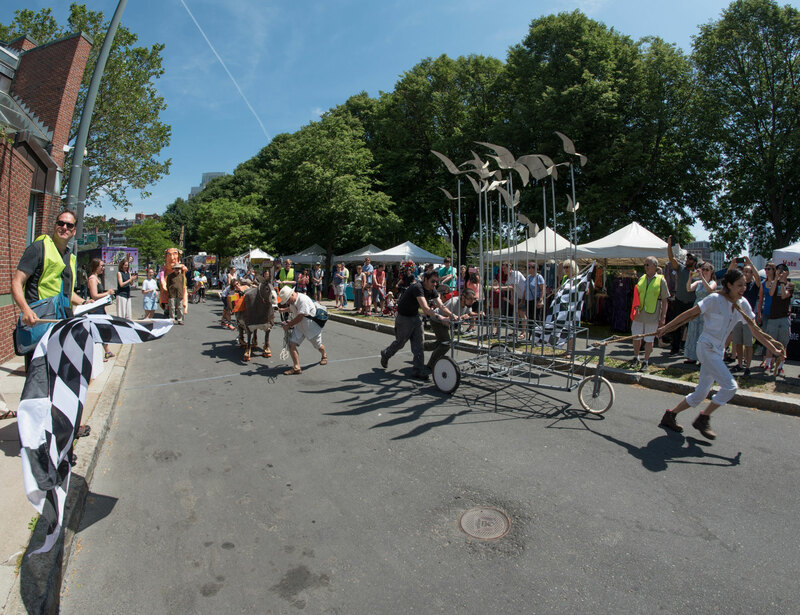 People’s Sculpture Racing, whose inaugural events were in 2015, fashioned its mission both to maintain a strong artistic tradition in the custom and standard of the WSRS and also to open up the project to the community and emergent artists and inventors. This accounts for the specific character of the two different races. Everyone is invited to submit applications for and participate in both races, with the caveat that jurors must approve River Festival teams, and all must follow the guidelines. In past years, families who initially participated in the Community Race entered and contended in the River Festival. Likewise, River Festival racers have participated in the Community Race. PSR already has one offshoot–Rockland Sculpture Racing, started by PSR Advisory Board Member Kim Bernard. Kim has paved the way also by providing in-school workshops and a very successful race for middle school students. Please also see the First Manifesto of People’s Sculpture Racing.